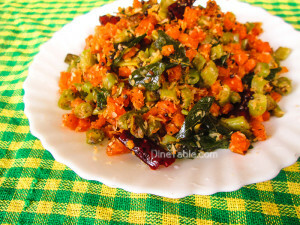 Carrot Beans Thoran Recipe / കാരറ്റ്‌ ബീൻസ് തോരൻ / Carrot Beans Stir Fry Recipe is a quick and easy vegetarian recipe which can be included in your menu for kerala / Onam sadya. I like to follow the traditional way of preparing thoran by which the flavor and aroma are never lost. 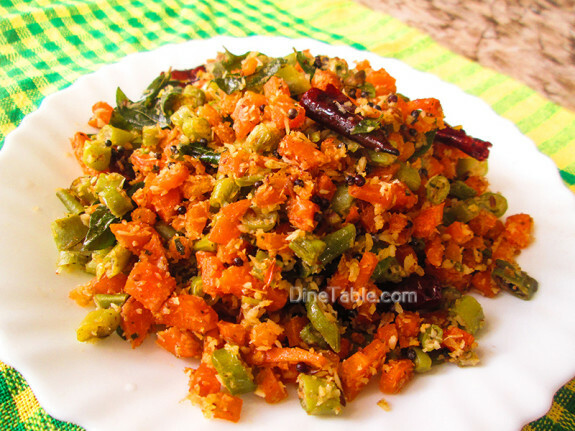 You can add split urad dal (ഉഴുന്ന് പരിപ്പ്, uzhunnu parippu) which gives a nice taste to the thoran. Carrots are rich in anti-oxidants, vitamins and dietary fiber. 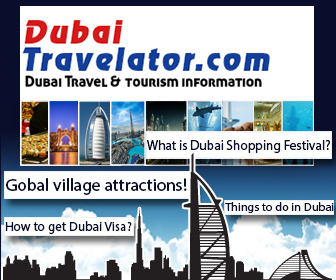 They are exceptionally rich source of carotenes and vitamin-A. Beans Green beans, also know as french beans or snap beans. Fresh green beans are very low in calories (31 caloriess per 100 g of raw bean pods) and contain no saturated fat. They are also very rich source of dietary fiber. Click here for other healthy and delicious thoran recipes..
Clean and Cut the beans and carrots into small pieces. 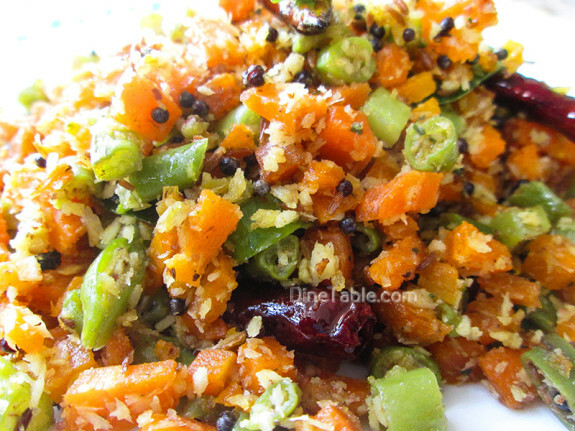 Grind coarsely coconut, cumin seeds, shallots, green chillies without adding water. 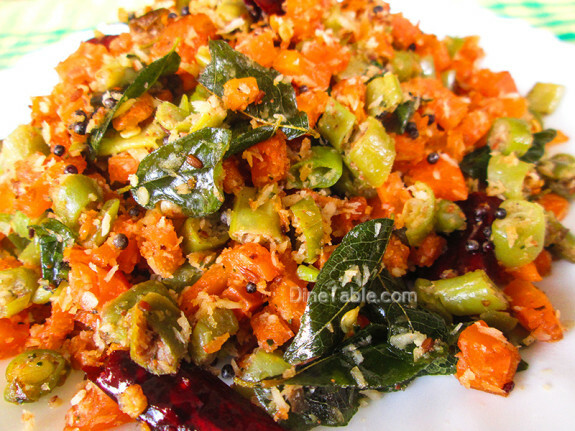 Heat coconut oil in a pan and add the mustard seeds and split urad dal (ഉഴുന്ന് പരിപ്പ്, uzhunnu parippu). Add the curry leaves, chopped carrots and beans. Add turmeric powder and salt. Close with a lid. Lower the flame and cook, stirring occasionally. 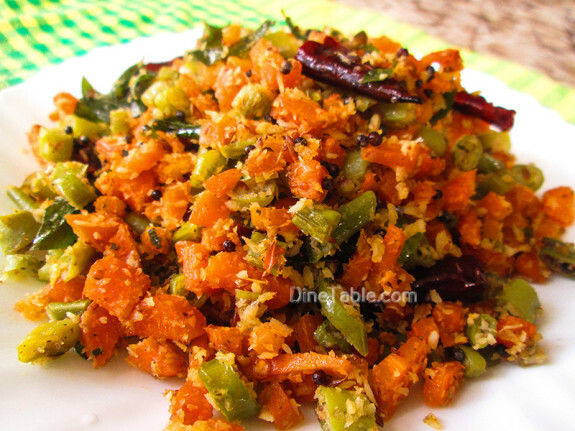 When the carrots and beans are almost cooked, add the coconut mixture. Stir well and continue to cook until the vegetables are cooked. Switch off the flame. 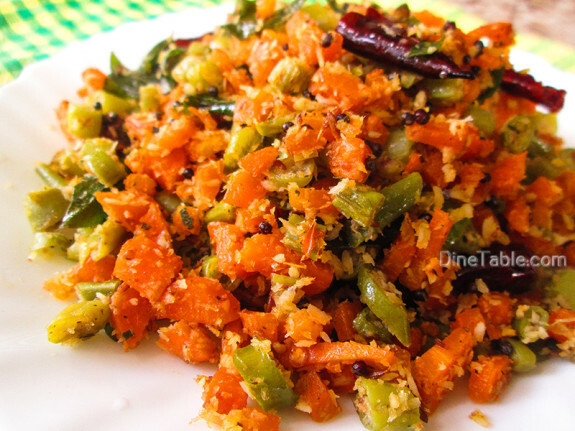 Tasty Carrot Beans Thoran is ready.